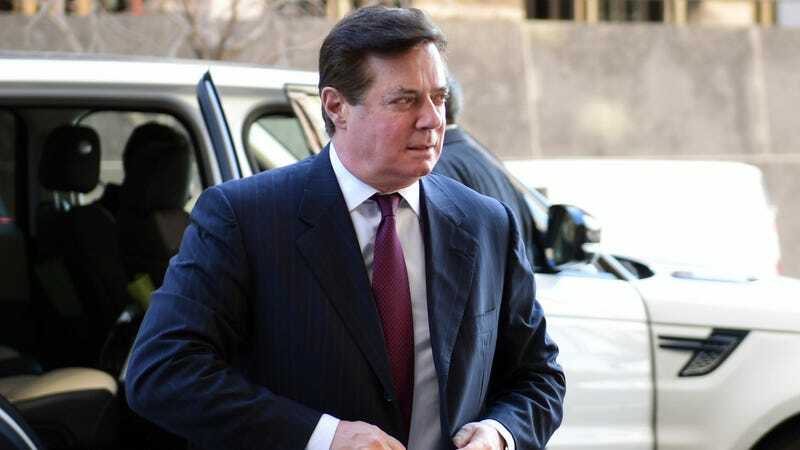 Report: Paul Manafort Tried to Score Deal With Ecuador to Hand Julian Assange Over to the U.S.
Paul Manafort arriving at federal court in Washington, DC in 2017. Julian Assange, the embattled Wikileaks founder who has been holed up in the Ecuadorean embassy in London since 2012 for fear he could be extradited to the U.S. for publishing classified material, is in deep trouble. Court documents mistakenly released appear to suggest that he is facing unspecified, sealed charges in the U.S. that could either be espionage—a move that could be very ominous for other journalists who have published government secrets—or other theoretical charges regarding alleged relationships with hackers that went beyond protected journalistic activity. As it turns out, his Ecuadorean hosts seem to have been even more eager to get rid of their troublesome guest than has previously been reported. A report in the New York Times on Monday alleges that Paul Manafort, the prison-bound former chair of Donald Trump’s 2016 campaign, tried to strike a deal with inbound Ecuadorean President Lenín Moreno in May 2017 to turn Assange over to U.S. authorities. In at least two meetings with Mr. Manafort, Mr. Moreno and his aides discussed their desire to rid themselves of Mr. Assange, who has been holed up in the Ecuadorean Embassy in London since 2012, in exchange for concessions like debt relief from the United States, according to three people familiar with the talks, the details of which have not been previously reported. As the Times noted, soon afterwards it became clear that Special Counsel Robert Mueller and his team considered Manafort one of their juiciest targets. Manafort’s attention was thus otherwise occupied, and the talks never came to anything. ... The trip to Ecuador was part of a whirlwind world tour that represented the last gasps of Mr. Manafort’s once lucrative career. In those final months, Mr. Manafort pitched officials from a range of governments facing a variety of challenges, from Puerto Rico to Ecuador to Iraqi Kurdistan to the United Arab Emirates. Mr. Manafort, who served on the board of the Overseas Private Investment Corporation in the Reagan administration, presented himself as a liaison to the new Trump administration and, in some cases, as a broker for arranging investments from a fund associated with the state-owned China Development Bank. At the time of the discussions, the paper wrote, Assange had not yet been charged and Wikileaks was a favorite of team Trump—specifically because of the organization’s role in publishing the hacked Democratic documents. So there may not have been any appetite on the U.S. side for such a deal at that time. After the talks went nowhere, Ecuador made Assange a citizen, and then reportedly tried to get rid of him by sending him to Russia in a diplomatic capacity. While most of the recent furor regarding Assange has involved questions about how closely he worked with the Russians that U.S. intelligence asserts are behind the Democratic hack, the nature of the charges against him in the U.S. remain unknown. Wikileaks has published material obtained by hackers who broke into private intelligence firm Stratfor, among several other U.S. companies; a trove of documents illegally stolen by former U.S. Army intelligence analyst Chelsea Manning; and countless other national security secrets. It’s possible that prosecutors have charged him with violations of the Espionage Act for publishing classified information, but that involves some daunting legal hurdles and could have far-reaching ramifications for journalists who publish U.S. government secrets in the future. Wikileaks has become increasingly reckless in its approach (and Assange obviously desperate for Trump’s favor, to no avail) since the self-imposed exile in the embassy began in 2012. On Monday night, Wikileaks’ Twitter account posted a link to an ethics complaint against Mueller by Jerome Corsi, a conspiracy theorist and former Infowars regular who investigators believe knew about Wikileaks’ plans to release the hacked Democratic documents in advance. Prosecutors are still considering charging Manafort, who is cooperating with Mueller’s team, with additional crimes.